Members of the Delaware County Electric Cooperative (DCEC) interested in local green energy were in for a bit of a surprise when the cooperative announced in its Jan/Feb 2014 newsletter (PDF) that it was abandoning its long standing net-metering based agreement with its own members who had installed grid-tied member-owned distributed generation, such as rooftop or ground mounted solar systems or small residential wind turbines. 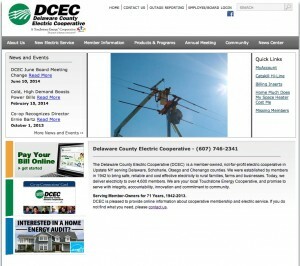 DCEC, which has about 5,200 members, is one of four small electric cooperatives in New York, founded in the early 1940s as part of the Rural Electrification Administration which brought electricity to unserved rural areas. The vast majority of New Yorkers are customers of investor-owned utilities, such as NYSEG and ConEd. Customers of investor-owned utilities in New York State who install distributed generation systems receive full credit at the retail rate for each kilowatt hour their renewable energy systems produce. This arrangement, called net-metering, has been in effect since 1998. In stark contrast, DCEC’s new member-owned distributed generation policy will credit members at the coop’s wholesale cost of energy, which is under 3 cents per kwh. As the energy flows back and forth across the meter, to and from the grid, the member loses much of the value of the energy produced by the system they have invested in as the energy is bought and sold throughout the day. The effect of this is so dramatic that several members’ yearly electric bill will more than triple under the new policy. In fact, the new policy will virtually ensure that DCEC members will be unable to install economically viable solar and wind systems in the future. DCEC CEO/General Manager Mark Schneider participated in a panel discussion closing out this year’s Delaware County Sustainable Energy Symposium at Delhi College in March. Some DCEC members, having spent the day at the symposium learning of many exciting advances in local renewable energy, wanted to know the rationale behind DCEC’s policy. They described the negative impact the policy change would have on members’ ability to add economically viable renewable energy generation to their homes. Those members were not satisfied with what they heard from their CEO/General Manager. Since then, several members have been trying to get the CEO and the board of directors to reconsider the policy. They have attended board meetings, generally held on the fourth Tuesday of every month, and have spoken for their allotted five minutes about their concerns, trying to understand the cooperative’s position. At this point, the board seems fully committed to this policy, even though they have been made aware of its potentially negative effect on its own members and on the growth of local green energy in Delaware County. Each year, the cooperative holds an annual meeting to elect directors to the board and vote on other issues. This year, three of the seven board seats are up for election. Perhaps changing the makeup of the board of directors is one way to coax the cooperative toward policies which promote clean energy, local economic development and enhanced resiliency on the cooperative’s electric grid. This year the cooperative holds its annual meeting on Friday, September 19 at the Delaware Academy in Delhi. 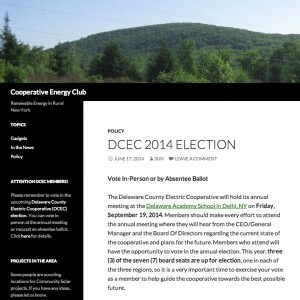 All members concerned about guiding the cooperative towards policies which support local green energy and economic development in Delaware County should seriously consider voting to install three new directors this year. Tom Martone lives in Bovina, and is a member of the Delaware County Electric Cooperative. He says about 150 co-op members live in the Town of Franklin.